OS grid reference: SD 8476 4725. 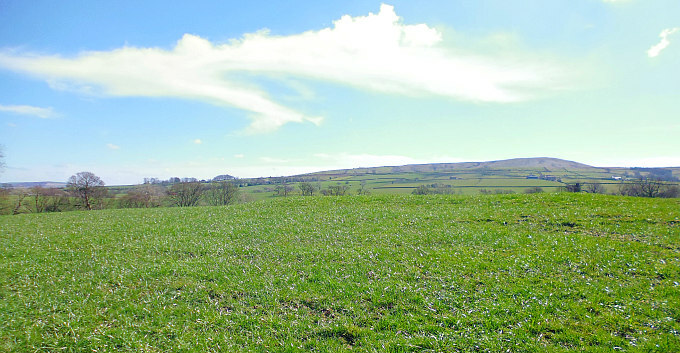 Near Coal Pit Lane – about 1 mile to the south-east of Gisburn, Lancashire, there is a small, square-shaped earthwork that sits upon the north-side of Primrose Hill. But unfor-tunately hardly anything is known about this solitary earthwork apart from the probability that it dates from the Roman period. 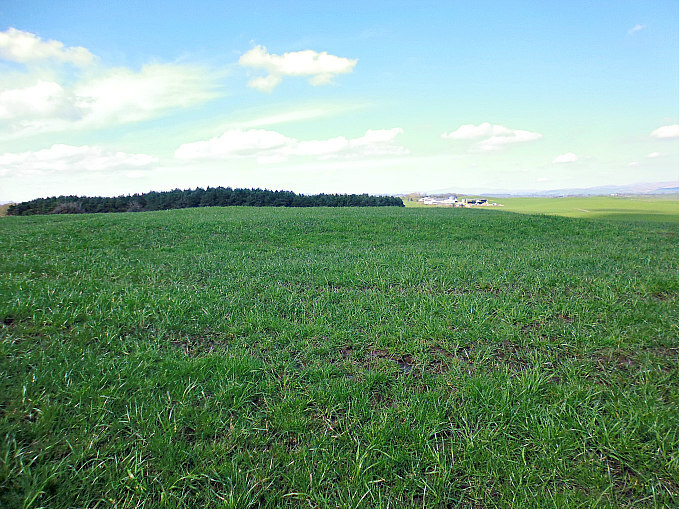 This earth-work is located beside a footpath close to Hesketh Farm. There are other Roman features in this area: 600m to the north-west is the well-defined earthwork known as Bomber Camp, and 500m to the south-east there are faint traces of the Roman road that runs from Elslack to Ribchester. The Primrose Hill earthwork can be reached from the A682 out of Gisburn, turning onto Coal Pit Lane for maybe ½ a mile, then walk along the footpath/track towards Hesketh House Farm. Via off to the north before the farm, then north-east along footpath (following tree line) for 160m to reach the low hill (Primrose Hill) on the right. This roughly square-shaped earthwork or earthen platform on Primrose Hill is about 1m (3 feet) high and 10m (nearly 33 foot) square. It is quite prominent when viewed close-up from just below the hill itself, but from further afield it is not particularly visible and would be easily walked passed. There is a dearth of information with regard to this site – although it is conjectured to have been a Roman watchtower or signal station – the later being more unlikely due to the smallness of the earthwork. A watchtower seems more plausible due to the feature being situated on a hill with lower ground on the N side and its nearness to a Roman road on the S. If this “were” a watchtower of the late Roman period, it would have been garrisoned by only ten soldiers at any one time. The thinking being that this particular watchtower never even saw the light of day, it was quickly abandoned and never begun, leaving just an earthen platform. The nearby Roman earthwork ‘Bomber Camp’ ended its days in a similar vane – only surviving for a short period of time towards the end of the 4th century AD. Primrose Hill Earthwork, near Gisburn, Lancashire. The author John Dixon in his work ‘Journeys Through Brigantia’, (Volume One), says of this earthwork that: “During June 1971 the site was excavated by Alan King and the Chorley College of Education. No post-holes or masonry were found, nor any finds. There was no ditch around the earthwork, but the boulder clay of the mound contained sand-stone while the drift below was more calcareous, and so it was given to be man-made.” And so with the lack of any ‘good’ credible information this Roman earthwork, if that’s what it was, shall have to remain just a miscella-neous earthwork of uncertain date – at least until further information arises. Dixon, John & Phillip, Journeys Through Brigantia (Volume One), Walks in Craven, Airedale and Wharfedale, Aussteiger Publications, Barnoldswick, 1990. Categories: Earthworks, Roman Sites | Tags: Primrose Hill Earthwork near Gisburn in Lancashire | Permalink.